This is the fifth report in the Connected World Market Insights Series. Together, decentralization and connectivity have significant potential to address some of the current healthcare system’s greatest challenges and, importantly, may result in better health outcomes for citizens, while reducing the financial burden on the public purse. Successful implementation will require the combined and unified efforts of decision makers, healthcare professionals, healthcare institutions (hospitals), community-based facilities and patients. This report is part of the Connected World series and will investigate the many aspects of community-based and connected care. As Part 1, it is intended to provide background on the factors shaping the transformation of healthcare. An upcoming report (Part 2) will delve into the technologies required to successfully move care into the community and to connect all system players. Ontario entrepreneurs and researchers are hard at work developing new innovations that will fundamentally transform the existing healthcare delivery model. The follow-up report (Part 2) will highlight a selection of innovators and showcase the progress that Ontario is making. While Canada out-spends most of its peers in terms of healthcare investments, this has not necessarily translated into better results for Canadians’ health. 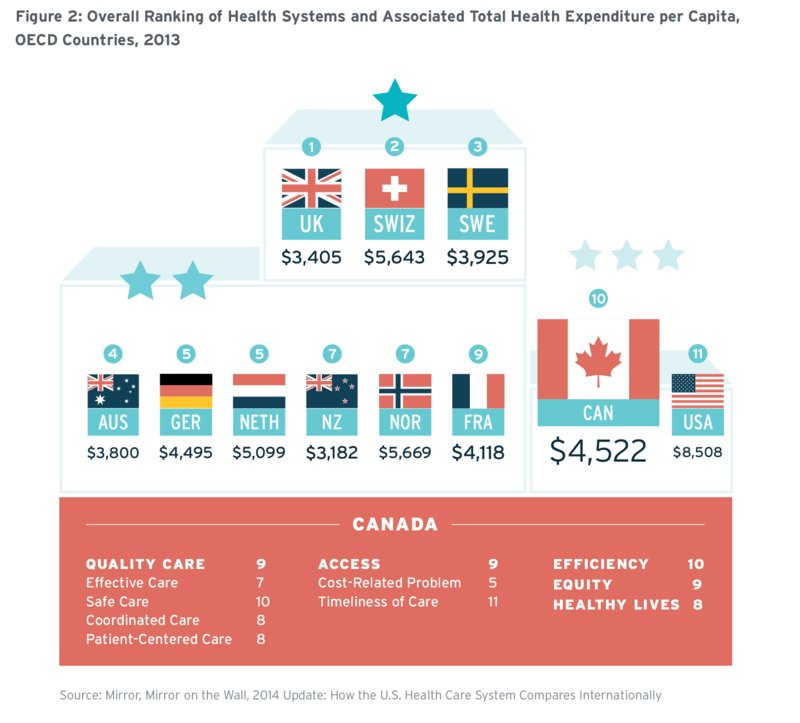 A recent study conducted by the American healthcare think-tank the Commonwealth Fund ranks Canada’s healthcare system tenth out of 11 peer OECD countries (Figure 2).11 Canada only ranked higher than the United States. 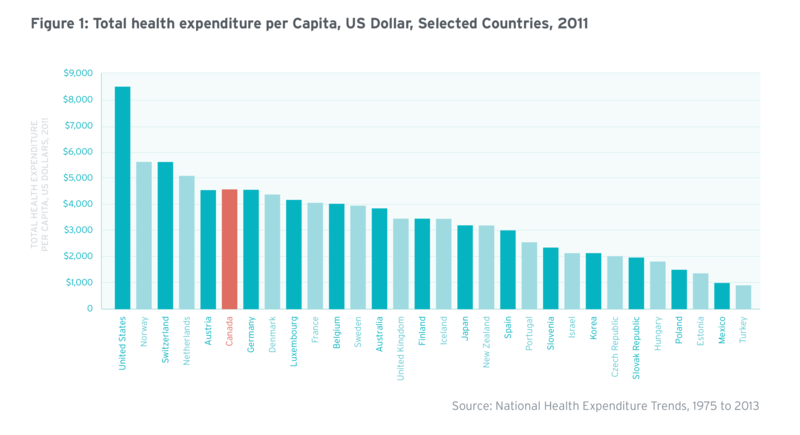 The United Kingdom ranked first overall, despite the fact that the country spends only $3,405 per capita, approximately $1,000 less per person than Canada.12 Based on such studies, many have argued at a macro level that our current healthcare system is not working as effectively or efficiently as it could. Like many jurisdictions around the world, Canada faces complex healthcare challenges. Here, we highlight four challenges that are putting pressure on the current healthcare paradigm—the first two are largely population driven, while the latter two are system driven. Those challenges are: 1) managing the ubiquity of chronic illness; 2) caring for an increasingly aging population; 3) the increasing cost of labour; and 4) the adoption of new medical technologies. Chronic illnesses are nearly preventable, as they are caused mostly by behavioural and lifestyle choices. Maintaining a healthy diet, getting physical exercise, abstaining from tobacco use and not consuming harmful amounts of alcohol can prevent approximately 80% of cases of heart disease, diabetes and respiratory diseases, and 40% of cancers.19 Despite this fact, 50% of Canadians are not consuming enough fruits and vegetables, 50% of adults are not getting enough exercise, 20% of Canadians are smokers and 5% consume alcohol on a daily basis.20 This supports the notion that community programs targeted at changing personal behaviour can have great impact on reducing the devastating effects of chronic illness, both on a social and an economic level. Our healthcare system was not designed to provide healthcare to a population of seniors who would live into their eighties, often with multiple chronic conditions. The solution to caring for an aging population lies in how and where care is provided to seniors. The high cost of labour in the healthcare system can be partially attributed to the fact that, unlike other labour-intensive industries, technological innovations in healthcare in general have not greatly reduced the need for (or cost of) labour.35 In fact, in many cases novel technologies further amplify the need for human labour,36 largely because new technologies require skilled professionals to operate them. There are some instances where health technologies can increase productivity and reduce labour-associated costs. Good examples of these types of innovations are modern health-IT type technologies that reduce or eliminate the need for administrators and other healthcare professionals.37 Interestingly, it has been emerging countries that have been quick to adopt health-IT technologies, primarily because of shortages of skilled labour.38 For example, in Mexico and India, healthcare has moved from the hospital to the home through the use of telemedicine services.39 These services are relatively inexpensive and provide care in an efficient and effective manner. On one hand, the direct costs of the Canadian health system adopting these new technologies have been shown to be a key driver of inflation.41 On the other hand, many argue that the reason new technologies drive healthcare inflation is that the full impact of these technologies on reducing demand for health resources is never realized upon their introduction. That is, we are adding new costly technologies—the results of decades of investments in biomedical research—to a system that is fundamentally broken in its design, leading to a “more expensive broken system” instead of a better operating system. Michael Porter, a professor at Harvard Business School and one of the world’s foremost thought leaders on transforming healthcare, summarizes this issue nicely: “Today, twenty-first century medical technology is often delivered with nineteenth-century organization structures, management practices, measurement methods, and payment models.”42 Our healthcare system needs to be redesigned in order to reap the full benefits of advanced medical technologies, which will result in a more efficient system. Given the current state of our healthcare system and the future health needs of Canadians, maintaining the status quo is not an option. Jurisdictions across Canada are looking to significantly change how healthcare products and services are designed, delivered and paid for, particularly as costs driven by the aging population, chronic disease and adoption of advanced technologies become more burdensome. Healthcare delivery has traditionally been designed around the provider, located in institutions such as hospitals, clinics or doctors’ offices. In place of formal, institutionalized care, health systems are now making a more patient-centric “shift left” (Figure 3) toward settings where the care goes to the patient, instead of the patient going to the care.44 These new settings may include a patient’s home, community health centre, school or workplace, and many more locations convenient to citizens, such as retail shops (Figure 4). Some regions are even trying mobile units45 that move around the community, providing care where and when needed. This responsive model provides more flexibility than the capital-intensive, bricks-and-mortar, institution-centred approaches. Though these may seem like non-traditional locations to deliver healthcare, in many cases they are already the preferred destination; for example, flu vaccinations provided at the workplace or local pharmacy, wound care provided at home by a visiting nurse, diabetes nutrition education provided at a local community centre and so on. Increased patient comfort and ease Many individuals experience anxiety and discomfort when visiting a doctor or hospital. This can affect more than simply their emotional well-being: Studies show that 20–25% of patients with high blood pressure are actually suffering White Coat Syndrome, a phenomenon where doctor- or clinical setting–related anxiety induces an acute increase in blood pressure.48 Using new technologies to provide healthcare in an informal community setting and having allied healthcare professionals provide the care may help to put more patients at ease. Leveraging community settings and less trained staff can also greatly improve access to care, especially for vulnerable populations who face barriers to accessing formal medical models of care (such as geographic distance or literacy problems) and can also reduce wait times. Lower service cost Hospital infrastructure and highly skilled professional labour (physicians, nurses) are costly and in limited supply. When acute care is not required, it is best to avoid these costly service options, instead using less capital- and resource-intensive settings (for example, homes, workplaces, malls and community centres) and leveraging staff with the minimum sufficient skills (such as personal support workers, occupational therapists, physical therapists and midwives). In many cases, this allows the health system to provide the same or improved care at a lower cost. Healthy Northland Emergency Meningococcal C Vaccination Programme (NZ)56 Introduced in response to a 2011 outbreak, vaccinations were promoted and delivered by the public health service, primary health providers, Maori service providers, schools, general practice clinics, community clinics and outreach home-based vaccination services. The program successfully vaccinated 73% of the targeted population. Health at risk/Worried well txt2stop Smoking Cessation Program (UK)57 Smokers were sent text messages of behavioural-change support to encourage smoking cessation. After six months, participants were significantly more likely to have quit smoking. Unwell/Sick Wound Healing Community Outreach Service (AUS)58 Clients accessed the nurse practitioner–led community-based wound clinic on an ongoing basis, without need for a referral. Clients received treatment, peer support and prevention strategies in an informal environment. The program resulted in 90% of leg ulcers healing within 24 weeks (a two-week reduction). Chronically unwell Diabetes Health: It’s In Your Hands (US)59 Type 2 diabetics had access to one-on-one (home) or group (community) sessions led by paraprofessionals on goal setting, problem solving, and learning-, movement- and food-related activities. After 10 weeks, participants had significantly improved their HbA1C, BMI, smoking habits, fruit/vegetable intake, and appraisal of diabetes scores. Palliative (end of life) Silver Chain Community-based Palliative Care (AUS)60 Adults with cancer were given early access (90+ days prior to death) to community-based palliative care. This group was significantly less likely to visit an ER, and was thereby able to avoid the associated stress. Ontario will confront a number of challenges as it moves forward with implementing increased community-based care. Complexity of care co-ordination When care is spread between different locations and providers, it’s difficult to ensure the patient is receiving optimal care that meets theirneeds. Without a more integrated approach, “patients can get lost in the system, needed services fail to be delivered or are delayed or duplicated, the quality of the care experience declines, and the potential for cost-effectiveness diminishes.”66 Ontario’s current system, particularly with respect to palliative home care, has been described as “a patchwork of independent players in which neither the payer nor the providers are directly accountable for health outcomes or for resource consumption.”67 In the future, improved care co-ordination will depend upon the use of electronic medical records (EMRs),68 electronic health records (EHRs), secure communication tools and other technologies, and will require protocols allowing the sharing of personal health information between providers within a patient’s circle of care. Availability of relevant and timely health information Healthcare, like most knowledge-economy sectors, is about communicating information and acting on that information. The vast majority of healthcare providers now keep some form of digital medical record (70% of Ontario physicians use an EMR in their practice),69 but a record on its own is not enough to ensure the best care, particularly if there is no effective means of sharing the information it contains with the people who can make decisions based on that information (that is, patients and their formal and informal caregivers). Even within the same provider, for example, a hospital, “important information often remains siloed within one group or department because organizations lack procedures for integrating data and communicating findings.”70 This challenge is made more complex due to concerns surrounding data privacy and security. Many efforts are underway to put measures in place to ensure the “appropriate use of data for health system decision-making,”71 by preventing unnecessary access while also facilitating access for those who need the information. Most importantly, to continue the transformation toward patient-centricity, systems to capture patient consent must be used to guarantee, “patients’ wishes are followed regarding the secondary use of their personal health information.”72 Most experts agree that these challenges are difficult, but are not the bottleneck to progress. The more salient barriers are around workflow and technical challenges. Within internal medicine, workflow-related factors such as “policies and procedures, inefficient processes, teamwork, and communication,” contributed to diagnostic error in 65% of cases.73 Changes to these factors will require careful workflow re-design, the adoption of which may depend heavily on workplace culture and physicians’ willingness to stray from tradition. From the technical perspective, records kept by one provider are often in a format incompatible with others’ systems. Moving forward, technologies must be “designed for interoperability, using common approaches and content standards, to enable health system use of data.”74 Once these challenges are addressed through policy and technology, providers will have the information they require to provide the best care. Capacity [inlinetweet prefix=”” tweeter=”” suffix=”We can make the shift.”]Currently, the demand for community-based care outweighs the supply:[/inlinetweet] only 6% of Ontario’s $45 billion in healthcare spending is dedicated to community care, while almost 35% is put toward the operation of hospitals.75 As a result of this imbalance, Ontario relies upon expensive alternative level of care (ALC) hospital beds, where patients remain until they are admitted elsewhere.76 Moving care into the community will not be possible until the necessary community resources (facilities, staff, supplies and technology) are identified, funded and put in place. Many of the initiatives and challenges above share a common theme: the availability of data, and its effective communication and use. Achieving a system that is integrated with community-level assets requires information to flow to all providers in an individual’s circle of care (hospitals, clinics and third parties such as home-care providers and informal care providers). Service between care providers can be co-ordinated through connectivity, allowing for seamless collaboration. Ontario is increasingly focused on improving health-IT infrastructure and policies relating to the digitization of data from across the system, and how that data is used, collected, communicated and acted upon. In doing so, Ontario will ensure the required connectivity tools and information are available to those providing care throughout the province’s communities. For connected health to become a reality, seamless interoperable [inlinetweet prefix=”” tweeter=”” suffix=””]health data must flow bidirectionally between individuals and their care providers in real time[/inlinetweet]. A core system-level asset in connected health is the electronic medical record (EMR) maintained by healthcare providers, which allows primary care providers to capture and store patient information. Data elements within an EMR can include patient demographic information, diagnosis, lab results, medication, medical history and many others. Supporting solutions include clinical decision support systems (CDSS), computerized physician order entry (CPOE), and specialized systems, such as picture archiving and communication system (PACS) for storage and access of medical images, and laboratory information management systems (LIMS) for use in laboratory settings. Health information exchanges (HIEs) or repositories bring together the plethora of provider-based digital health data sets to allow ubiquitous access to health information from different vendors, providers and sometimes patients, often across different locations. For HIEs to be effective, the software must follow specific standards that enable the communication between the constituent pieces of software. In Canada, Canada Health Infoway (CHI) detailed the health information access layer (HIAL) standard that all HIE software in the country must use. 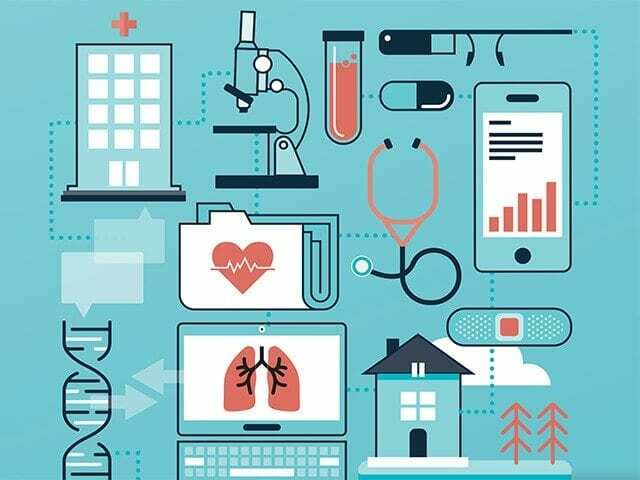 These consumer digital health technologies consist of tools used outside of traditional medical settings, leveraging data found in the formal healthcare system (for example, in the EMR), to increase engagement with a person’s circle of care, in order to better track and manage their health. These technologies also carry the potential to redefine how a patient’s formal healthcare team can seamlessly keep abreast of their patient’s health status, and work together proactively to keep them healthy. For example, in the near future, the concept of scheduling an annual check-up will be outdated. 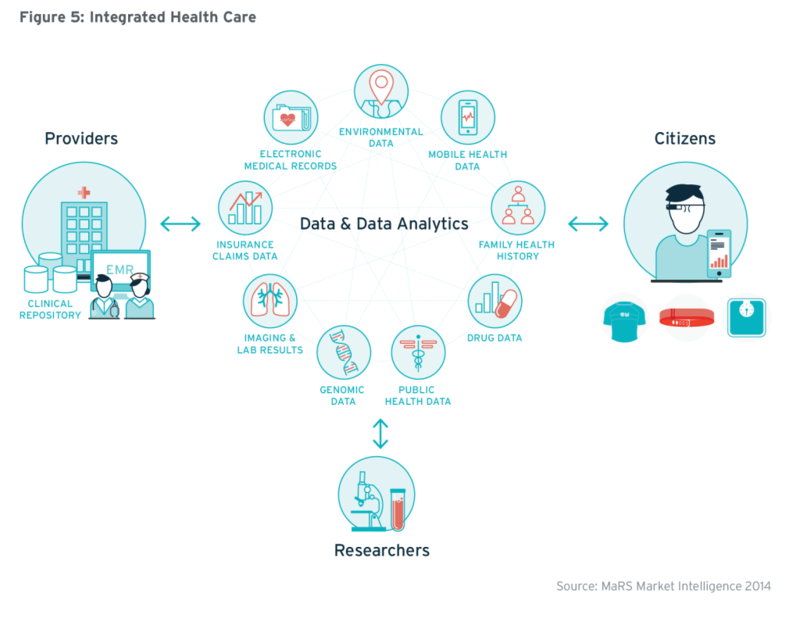 Data analytics brings it all together, completing the connected health ecosystem. Analytics, and the applications that make the data actionable, will ultimately transform healthcare by enabling decisions to be made by each of the members in the full circle of care around an individual. This will help Ontario reach its goal of providing the right care for the right patient at the right time—for the right price. 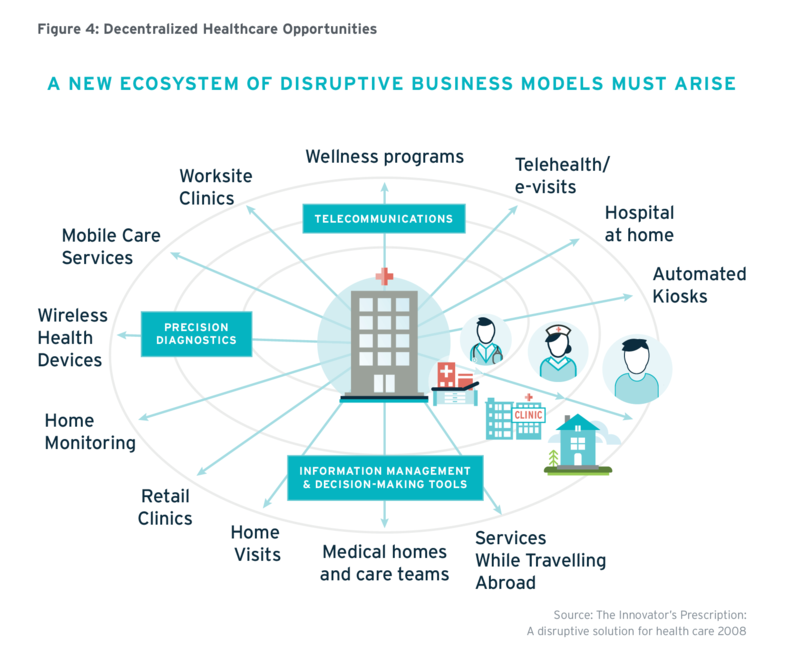 Enabling the shift toward community-based healthcare only skims the surface of the value and benefits of connected health. Below is a summary of additional ways that connected health affects stakeholders in Canada’s health ecosystem. Citizens Citizens are more engaged with their healthcare providers and more motivated to self-care. They can easily book appointments, check their health status, track and send data to their provider, and verify medication and vaccination records. In the US, citizens are downloading their personal health records from multiple care providers using the Blue Button initiative. Blue Button is now machine-readable, so that mobile apps can leverage the standard to help patients track and manage their disease. Researchers and innovators Connected health can augment insight derived from clinical trials. It can also aid in personalized medicine research. The EMR used by Kaiser Permanente provided the data that led to the discovery that Vioxx had significant adverse drug effects81 (serious coronary heart disease, fatal in 27% of cases).82 This led to the subsequent withdrawal of the drug from the market. Civil society Connected health data can be used to ensure rapid, co-ordinated detection of infectious disease. It can also allow citizens to effectively measure the efficacy of their health systems, facilitating policy changes based upon scientific facts. Toronto-based BioDiaspora uses Big Data analytics, including global air traffic patterns data, to predict the international spread of infectious disease. The BioDiaspora platform has been used by numerous international agencies, including the U.S. Centers for Disease Control and Prevention, the European Centre for Disease Prevention and Control, and the World Health Organization. 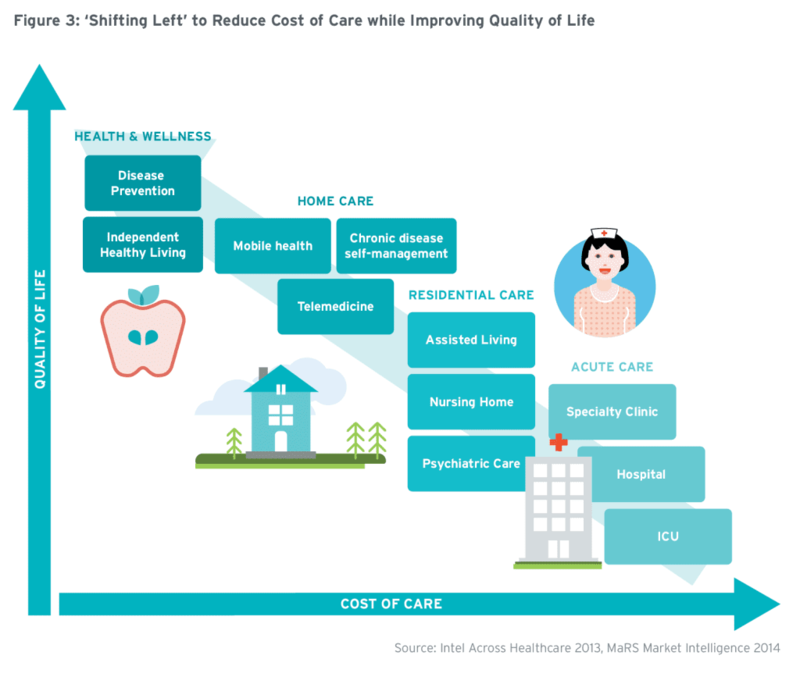 The shift toward integrating the delivery of healthcare services in the community with traditional formal care holds great promise to improve citizens’ health while keeping costs under control. Realizing these benefits entails a transformative innovation agenda, which will require Ontario to activate all levers of the health ecosystem. There is significant activity underway by each of these constituents of the Ontario health system. The next health-focused report in the Connected World Market Insights Series will concentrate upon the role of Ontario’s entrepreneurs in developing innovations that will fundamentally transform how (and where) healthcare is delivered in Canada. 8. Canadian Institute for Health Information. National Health Expenditure Trends, 1975 to 2013. 9. Canadian Institute for Health Information. National Health Expenditure Trends, 1975 to 2013. 10. Canadian Institute for Health Information. National Health Expenditure Trends, 1975 to 2013. 20. Public Health Agency of Canada. Chronic Diseases – Most Significant Cause of Death Globally. 21. Canadian Academy of Health Sciences. Transforming Care for Canadians with Chronic Health Conditions. 22. Canadian Institute for Health Information. National Health Expenditure Trends, 1975 to 2013. 23. Canadian Institute for Health Information. National Health Expenditure Trends, 1975 to 2013. 24. Canadian Institute for Health Information. National Health Expenditure Trends, 1975 to 2013. 26. Canadian Institute for Health Information. Seniors and the healthcare system. 27. Canadian Institute for Health Information. Seniors and the healthcare system. 28. Canadian Institute for Health Information. National Health Expenditure Trends, 1975 to 2013. 29. Canadian Institute for Health Information. National Health Expenditure Trends, 1975 to 2013. 30. Canadian Institute for Health Information. National Health Expenditure Trends, 1975 to 2013. 31. Canadian Institute for Health Information. National Health Expenditure Trends, 1975 to 2013. 33. Canadian Institute for Health Information. National Health Expenditure Trends, 1975 to 2013. 34. Canadian Institute for Health Information. National Health Expenditure Trends, 1975 to 2013. 40. Canadian Institute for Health Information. National Health Expenditure Trends, 1975 to 2013. 41. Canadian Institute for Health Information. National Health Expenditure Trends, 1975 to 2013. 42. Value-Based Health Care Delivery. (2012). 44. Health Progress. (2013). U.S. Health Care Is Moving Upstream. 46. Health Affairs. (2002). The case for more active policy attention to health promotion. 47. Health Progress. (n.d.). U.S. Health Care Is Moving Upstream. 52. Bodenheimer, T. (2002). Improving primary care for patients with chronic illness. Journal of the American Medical Association. 59. Saxe-Custack, A. & Weatherspoon, L. (2013). A patient-centered approach using community-based paraprofessionals to improve self-management of Type 2 diabetes. American Journal of Health Education. 60. McNamara et al. (2013). Early admission to community-based palliative care reduces use of emergency departments in the ninety days before death. Journal of Palliative Medicine. 72. Canada Health Infoway & CIHI. Better Information for Improved Health. 73. Graber, M.L. et al. (2005). Diagnostic error in internal medicine. Archives of Internal Medicine. 74. Canada Health Infoway & CIHI. Better Information for Improved Health.